Do you want to spend an active holiday? Are you interested in culture and civilizations? Do you enjoy dancing? Then you are at the right place! 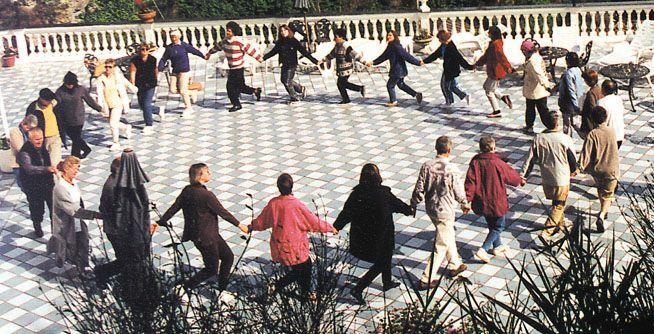 I offer journeys where participants have the opportunity to dance between three and five hours a day. The rest of the day is free to relax or get to know the culture of the country we are staying in by enjoying a hiking-tour, trips in the area, guided tours, and many anther options. This gives us the chance to achieve a status of physical and mental well-being. We dance international folk-dances, mainly from Southern Europe, the South-East of Europe and the Near East. Dances from Armenia are included in my repertoire, as well as gypsy dances, typical Central and Island Greek dances (Sirtaki and other), North- and South Italian dances (Manfrina, Tarantella and other) and many more. From over 25 years of experience, I (the course instructor ) know how to integrate proficient participants as well as less skilled dancers. And for those who are particularly enthusiastic I am happy provide extra instruction. We also move in different ways: exercises for the spine are a part of the programme offered, new games (California) which challenge men and women and develop body, mind and heart are another. I also engage as tourist guide in order to put across knowledge, cultural and historical curiosities and traditions of the country to the participants. Thus, you will not only dance when traveling to Europe with me, but trips to the area are also included in the journey. On the following webpages you will find dancing-journeys to different regions of Southern Europe, particularly to Italy. In the pull-down menu on the right or at the end of this page you will find more information. Concerning the trips with a date set it is possible to register as a single person. There are discounts for small groups starting with four persons or if you register very early (have a look at registration form). With regard to other journeys (without date set), I will organize special dancing and cultural programmes according to your preferences and at a date which suits you when there is a group of at least eight people (concerning possible destinations have a look on the left below). Have fun leafing through the following pages!